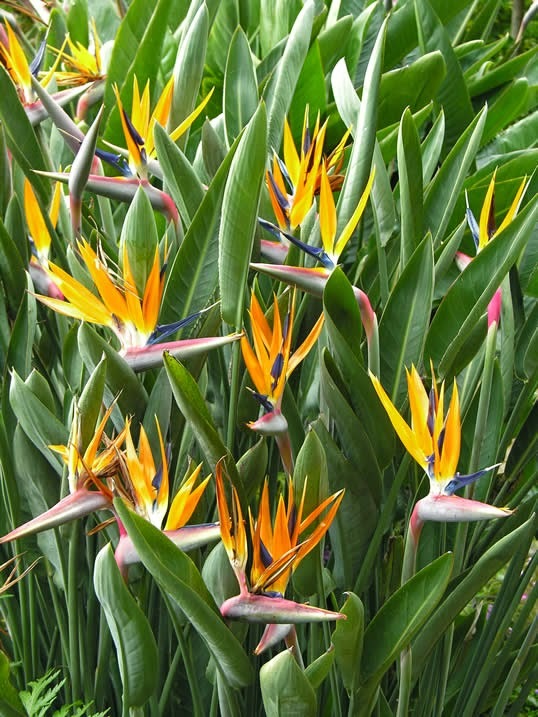 Strelitzia reginae, Bird of Paradise - well known in Madeira and throughout the mediterranean as a popular ornamental plant, an evergreen perennial. Native to the South African Cape it has large orange and blue and white flowers (reminiscent of a tropical bird’s plumed head) with the colourful crest perched on a boat-shaped, purple-tinged, green sheath-like leaf (bract or spathe), removal of the old spathe encourages further flowers to open. The flowers arise in succession and successively open although two are usually open at one time. They produce so much thick nectar (which is not sweet) that it trickles out and attracts the pollinating sunbirds and sugarbirds of its native South Africa. Strelitzia is named for a German patroness of the arts and amateur botanist, Queen Charlotte Sophia (1744-1818), who was a niece of the Duke of Mecklenburg-Strelitz and Consort of George III (1738-1820) of Britain. The couple were famously known as Mr King and Mrs King and had 15 children of which 13 survived to adulthood. She was much involved in the establishment of the botanical gardens at Kew and she extended Queen Charlotte’s Cottage (given to her in 1761 as a single storey building upon her marriage to George III) which still stands in Kew grounds.